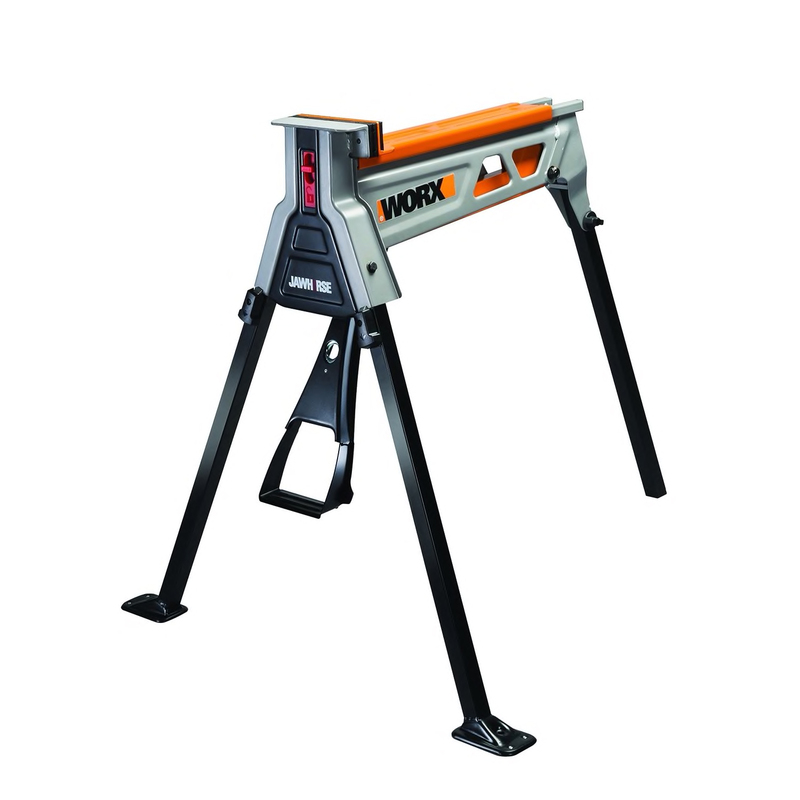 Check out the January/February 2019 issue of Extreme How-To Magazine to get a look at the new WORX JawHorse Portable Work Support Station. The magazine listed the JawHorse as a hot new product. The new WORX JawHorse provides do-it-yourselfers with a folding workstation that’s easy to transport wherever needed, then sets up in seconds to minimize downtime. This portable workhorse features a patented, foot-pedal-operated, clamping system that serves as an extra set of hands for a wide range of DIY projects. Although the JawHorse weighs only 35lbs., it’s constructed of heavy-duty powder-coated steel. Its three-legged, wide-stance tripod design provides solid footing even on uneven surfaces. The front legs have locking/unlocking tabs, and the rear leg has a locking knob. A locking/unlocking switch on the face frame secures and releases work pieces. What sets the JawHorse apart is its exclusive, foot-pedal, clamping system. By pumping the foot-pedal, the non-marring clamping jaw travels 1 in. with each stroke and compresses against the work piece until the desired tightness is achieved. The foot-pedal is equipped with a metal stirrup to prevent slippage. The JawHorse’s clamping jaw opens to 34-1/2 in. and has one ton (2,200 lbs.) of clamping force. That’s nearly three times the width and ten times the clamping power of ordinary bench vises. The versatile, clamping workstation supports loads up to 440 lbs. Yet, its non-marring jaws secure work pieces without damaging their surfaces. Visit worx.com.